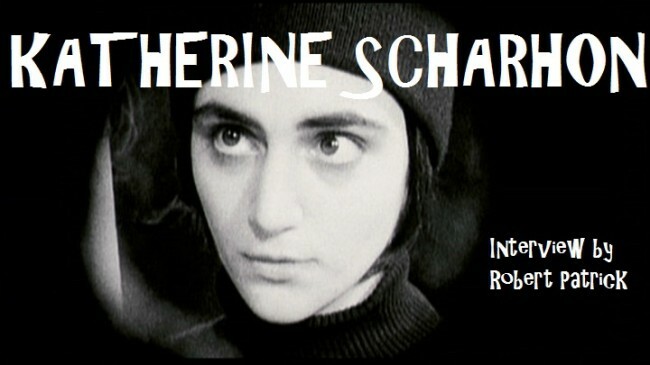 Flickering like an oil lamp in a monochrome nightmare, Katherine E. Scharhon, in a visually stunning presentation, remains with you long after you’ve seen their hauntingly inspired performance in Guy Maddin’s newest, and most ostensibly autobiographic, Brand Upon the Brain!. Playing two roles in the movie, as both Chance and Wendy Hale, a team of teenage sleuths investigating strange occurrences on a small Canadian island, Scharhon plunges into the archaic abyss of Maddin’s feverish filmmaking, and comes up with a film that one is not likely to forget. Robert Patrick: Brand Upon the Brain! Faired extremely well with critics and audiences alike. With this, you also garnered a lot of critical acclaim for your portrayal of both Chance and Wendy Hale. Living in New York, it had to have been nice to pick up the Times and see your name in print. Was this extra icing on the cake for you personally? Scharhon: It was definitely exciting – especially since at that time I had moved to New York fairly recently. I remember for weeks there had been all of these posters of Chloë Sevigny, or someone fascinating like that, posted on the sides buildings, and then all of the sudden one day they were all posters of Brand Upon The Brain!. It was definitely odd. What initially drew you to the script of Brand Upon the Brain? When I first heard about Brand! it was this untitled film project that was going to be produced by this new non-profit company, named The Film Company, in Seattle Washington. I guess the first thing that drew me to Brand! was the concept of The Film Company itself. Their idea was to find artists they were excited about and invite them to make a film. The idea being to greenlight artists themselves, and not scripts. When I auditioned for the film they asked me to do improvisations based on the characters from the film. After I got the role and was sent a copy of the entail film treatment, I remember being really excited about the idea of Chance getting dressed up in a mask and tuxedo to sleuth. Brand Upon the Brain! is submerged in a lot of dark imagery. Was it ever emotionally or physically exhausting to work on such a brooding, almost gothic storyline? Thinking back on it now it must have been sort of physically exhausting because everyone put in very long hours working on the film, as we made a feature film in less than two weeks. It was somehow both disorienting and invigorating at the same time. Guy was so spontaneous and interesting, and there was always lots of fog, strange tasks and sequences of things we were asked to do. We were constantly surrounded by wonderfully interesting people, and never knew what we might be jumping into next, so there was no time for the thought of being tired. That being said I did have the strangest dreams during that week. What was it like working with the cast of Brand? More specifically, what was it like working with Sullivan Brown and Maya Lawson? Maya Lawson and I trained together for four years at Cornish College of the Arts, prior to making Brand!. Their acting program is conservatory based, and by the end of it you know everyone very, very, very well. Because we had worked together so much, and knew each other so well, when we filmed Brand! we just got to play. We carpooled to and from set together, went to parties and film festivals together – we just had the greatest time. Maya Lawson is one of the best people I know, and I feel lucky to have been able to work with her on something like that. Sullivan was so great. I remember thinking that both he and Kellan, (who were both really young when we shot the film), were just so incredibly smart. The funny thing was, so much time passed between the film’s shooting and its premiere, that when I saw Sullivan again he was taller than me. Where did you draw your influences from while playing the Lightbulb Twins? Did you have a favorite out of the two characters? I once saw Victoria Chaplin perform live in Le Cirque Invisible. The whole piece was silent, and she had this way of grasping/lulling the audience with this under and yet totally concentrated way of being. I think I always have that in the back of my mind, especially if I’m working on something without words. Also, Strangely enough I found myself thinking of Johnny Depp, specifically in Sleepy Hallow and Edward Scissorhands. I have always liked how subtly and quietly odd he can be. As for a favorite between Chance and Wendy, I have to say I’m not sure I have one. Guy has been known to talk about how personal this specific movie is to him. Was there any additional pressure knowing just how important this film was to him? Making this film was the best time I’ve had in my life. While we were shooting I never had one worry, or anything. It all felt like one big magical party. I swear. I really feel like making the movie and screening the movie were two different worlds. I think the screenings felt like the stakes were higher, but I personally never actually felt any pressure. I could only look at things moment to moment without worrying about the outcomes. I think it was definitely easier to do that when we were filming because it was our own universe. I assume you had met Isabella Rossellini prior to shooting. And if so, was there any advice she gave you about working under Guy’s type of cinema, since she, too, had been in one of his pictures? The first time I met Isabella Rossellini was during the screening of Brand Upon The Brain! at the New York Film Festival. She is the most charming person I have ever met. What was your first reaction when watching the completed film for the very first time? I felt so proud of everyone. We had all worked so hard, and so intensely on this thing. The experience of making the film had been so brilliant, and there it was on the screen. It was strange because the filming felt like going to some unbelievable camp that was incredibly safe and small. Then, all the sudden, the byproduct of this quiet special thing was being projected on a giant screen. I think my internal reaction during that first screening had more to do with me learning the dynamics of being a film actor. There were lines that extended down the block, and I remember not really allowing myself to fully process that in the moment. I think during that first screening I engaged with the film as an audience member, more than I imaged I would. I got very weepy during the part where young Guy is remembering his senses from childhood, and is smelling everything. Have you been in attendance for one of the touring live shows of the movie? If so, who was your favorite narrator of the film? I enjoyed all the live narrators, as they each brought something new to the piece. I think both of the premieres stick out in my mind as exciting performances (at the Toronto Film Festival with Louis Negin and the New York Film Festival with Isabella Rossellini), because they were premieres. That being said, I think I might actually be partial to when the film plays with the pre-set soundtrack by Isabella Rossellini. I had a great time with the film at the Maryland Film Festival in Baltimore, and introducing the film at some theaters in New York, where it played with the pre-set narration. I think the recoded soundtrack makes the film feel intimate, as if it were playing just for you. If Guy asked you to be a regular in his films for now on, would you oblige? Before he finished asking me I would be there. There is already some merch flying around from the movie. Does it make you do a double take when you see someone with a Brand Upon the Brain shirt on? I haven’t seen many BRAND! shirts out there. I have seen a lot of the DVD though, and that always startles me. Correct me if I’m wrong, but Couch Couple was your first full length feature. With that being said, did you feel that your first full length experience with Lynn Shelton ultimately helped groom you for your sophomore effort with Guy? Brand Upon The Brain! was my first full length feature film. I was in Lynn Shelton’s feature film We Go Way Back, for literally – I think – one second, which is what you’re referring to. The film was made by the same company that made Brand Upon The Brain!, and went on to win best feature and cinematography at the Slamdance film festival. Because of timing We Go Way Back was completed before BRAND! but was technically shot second. My friend Amber Hubert, (who attended Cornish College with Maya and I), had the central role in the film, so it was great fun to see her work on set. It was a brilliant opportunity to hang out with my friends at The Film Company, and learn more about the workings of a feature film. I am also a really big fan of Lynn Shelton’s work and was glad to participate. What directors would you like to work with in the future? There are many directors I would like to work with, but for now here are three: David Lynch, Jamie Babbit, and Joe Swanberg. Maybe an assumption, but while growing up in Seattle, was music a big part of your life? Do you have any favorite bands or musicians that help you get ready before waking up and doing a reading or a film? I don’t think I realized how much the Seattle music scene played a roll in my life until I moved from Seattle to New York. There is this independent radio station called KEXP (www.kexp.org) that nearly everyone has on everywhere all the time in Seattle. I guess I miss that sense of community. One of my favorite bands from the Pacific Northwest is The Need. They formed in Olympia, Washington, but they don’t play anymore. They were incredible to see live and made rock operas and all sorts of things. Also, my friend Clyde has this band called Your Heartbreaks (www.yourheartbreaks.com) that started in Bellingham Washington. Your Heartbreaks has a new cd out now featuring a song with Kimya Dawson. I am also a fan of The Trucks (www.thetrucks.net), who are also from Bellingham. However, my most favorite band is Tegan and Sara. I have been a fan of theirs since 1999. I just got back from Toronto where I was working on a short film in which I played a ghost. For one part of the film I had to lay in the false bottom of this old trunk that one of the other characters discovers in her basement. The scene was shot in this dark area, and that coupled with the fact the trunk was so old and smelled like it was rotting, made me feel as though I were lying in a coffin. They also sprinkled dirt and dead leaves on top of me. That moment felt very Laura Palmer from Twin Peaks. Right now I’m also working on writing a film script that is turning into a sort of road movie. It involves two girls, false mustaches, coffee, walkie-talkies, and black and white striped t-shirts.